First wild camp for some time. Lights out: 9pm. Wake up at 7am. Lie in for an hour whilst Sue sleeps on. Very comfy. Tea on. Muesli bars ready. Breakfast is quick. Pack up in the tent as it's windy and cold (minus 3°C) outside. Away by 9.15. 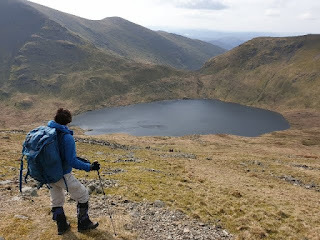 Soon up to Grisedale Hause. Pass various groups. Three tents at the eastern end of Grisedale Tarn. They are having a really long lie in. 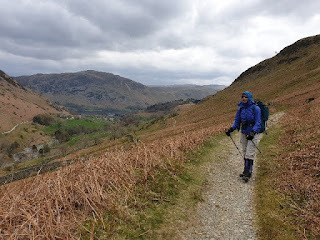 Slow plod takes us over Dollywagon Pike, High Crag and Nethermost Pike. Easy stroll from there to reach Helvellyn's summit at 11.30, where we find a sheltered spot to brew up and chat to an assortment of folk. One man arrives shirtless. It must be about minus 20°C with wind chill. Move on and soon lose the crowds. Traverse over Lower Man and White Side. Very windy here. Sue gets sprayed with grit by a mini tornado, then gets blown over. Bent walking pole and bruised leg. 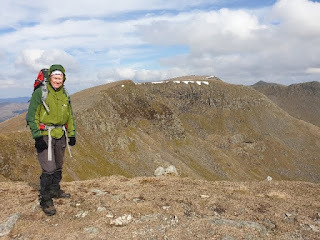 Decide to change planned route over Raise and Sheffield Pike. Take the easy path above Keppel Cove to Glenridding Common, where a sheltered spot for lunch and another brew is found. Switch to the south side of the Glenridding valley above the youth hostel, then enjoy the contouring path before rising above Lanty's Tarn then dropping into Grisedale. Reach Patterdale at 3.45. Tea and cake with Marian, and a minor gear review, focusing on sleeping mats. Back to Manchester, an easy journey. Stop at Jitrada Thai restaurant in Sale. Nice meal. Gear testing deemed a success, though dry conditions limited the extent of testing. Route description and more photos to follow. Hope it wasn’t a bent Pacer Pole. Look forward to seeing your photos. Sue's pole is just bent. I'm sure it can be easily mended or replaced. We've been using these poles for so long that we've got used to the foibles of the twist lock system, though my back up poles bought in Canada have a different system. Sir Hugh - When Pacer Poles get stuck behind I find that because of the way the handle is gripped, the tendency is just to pull. I’ve never had a twist lock fail on these poles but both my three year old Lekis failed completely a few days ago. Just for the record on twist lock poles. I went into the shop I bought a pair from and said that they have a tendency to drop under pressure. He agreed and told me to get some coarse sandpaper and rough up the nylon locking ferrule. I did this and have since had no problem. Just watch, now that I’ve said it, they will fail again. Useful information, as usual, Alan. I’ll give that a try. Thanks.